Nuneaton Town have appointed Brian Reid, the former Ayr United boss, as their new manager. Scotsman Reid, 43, who has signed a one-year contract taking him up to May 2015, will take charge of Boro's last three games of the season, starting with Saturday's visit of Barnet. Paisley-born Reid is a former Rangers team-mate, and good friend, of nearby Coventry City boss Steven Pressley. "I know Stephen from way back to our Rangers days," he told BBC Sport. "We've got a good relationship and that's something that could be beneficial to us. The former Scotland Under-21 international made 58 league appearances for Greenock Morton before signing for Rangers in 1991. After five years at Rangers, vying for a place in the same team as Steven Pressley, followed by a brief loan spell at Newcastle United, he returned to Morton in 1996. Spent a season at Burnley in 1998-99 before returning to Scotland to spend two seasons with Dunfermline Athletic. Another spell in Lancashire at Blackpool was then followed by moves to Falkirk, Queen of the South and Ayr, where he ended his career in 2007, before moving into the hot seat. "I've been doing quite a lot of scouting for Coventry throughout the country, most predominantly in Scotland. "He had said there was a possibility that the job might be coming up. It did so and I applied. "I'm delighted to have the opportunity because sometimes a lot of Scottish managers are maybe overlooked as they've not got Conference experience. "I hear that quite a lot but it doesn't scare me one bit. I know the market and, if you're a good enough manager it doesn't matter what league you're in. You should be able to prove your point." Reid, who twice had spells south of the border at Burnley and Blackpool in his 19-year playing career, left Ayr in 2012, after which he spent a year in the Philippines coaching the national Under-23 side. 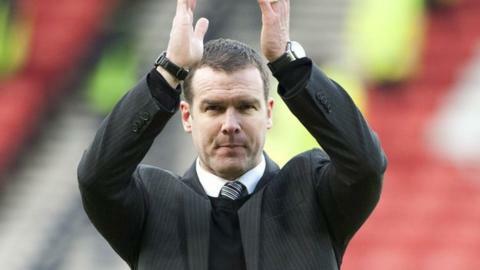 He enjoyed two promotions in his five seasons in charge of Ayr, winning five manager of the month awards. Boro have been under the caretaker command of Mark Noon since Kevin Wilkin left to join Wrexham on 20 March. But they picked up just one point out of a possible 15 in that time, culminating in Saturday's 3-0 defeat by Wilkin's Wrexham, to drop out of Conference Premier play-off contention. "Brian was by far the stand-out candidate and is a very impressive person," said Boro chief executive Ian Neale. "He will be looking to develop a side that plays attractive and winning football. "His background at Ayr in particular made him the ideal man for this post, as he was a full-time manager in charge of a part-time team in a full-time league. "He is also comfortable with being hands-on regarding the commercial side of things, which is an extra asset he brings to the job."